Melanie is a 1st year BSc Psychology student. Her favourite thing about her course is the wide range of engaging modules it has to offer. I was at sixth form studying my A-Levels in Psychology, Geography and Biology, and completing an Extended Project Qualification. I wanted to stay in London so when I was researching universities I was attracted to City because of its prime location in the heart of London. The course also has a wide range of modules. Hence, when I went for an Open Day, I realised that Psychology at City was the right course for me. I really like my course because of its wide range of very engaging modules. Also, the lecturers, members of staff and the Students’ Union are all very friendly, and make my experience of studying at City just wonderful. 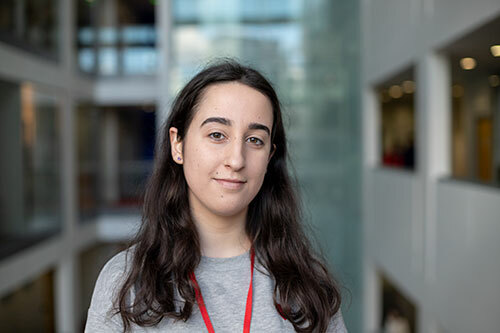 I work as a Student Ambassador for City, which is great way to be able to engage with other students at the university, as well as meet new people that are thinking about studying at City and helping them with their decision. I would love to have a career in either clinical psychology or cognitive neuroscience. Choose a course you are passionate about and want to study, as you will enjoy the university experience much more by studying something you love.